Ba’s goal – after a loose ball is not challenged, Newcastle make inroads down our right and Jonás Gutiérrez picks out Ba with a superb cross; the striker is left with a tap-in. There’s a loose ball in midfield – look at Modric, towards whom the ball is travelling. It is most unlike him, but he is stood watching and waiting, whilst Ba is alert and wants to win the ball back. …who fires out a first time pass to Gutiérrez. Gutiérrez has just Walker goal-side of him, although Modric now works hard to get back into position. …and then he fails to make a challenge (he could have conceded a free-kick as a last resort), as Gutiérrez dances round him. In doing this, he has also put Walker on the back-foot, and made it very difficult for him to make a decision. Note Livermore, side by side with Ba on the edge of the box. Gutiérrez gets to the by-line and lifts over a fantastic cross – Livermore has let Ba steal a match on him. Ba is left with a simple finish. Although he hits it straight at Friedel, the pace on the ball makes it difficult for Friedel. Could he have done better? Possibly, but it wasn’t as easy as it looked. 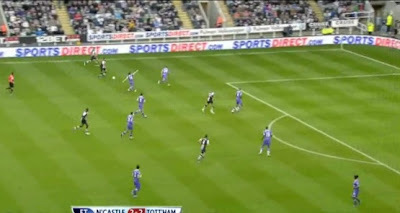 Ameobi’s goal – Ameobi holds off Walker, and finds Friedel’s left corner with a fine shot on the turn. Tiote snaps into a challenge (as he did all afternoon), beating Livermore to the ball. 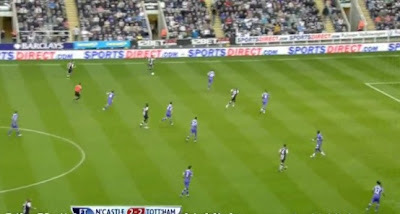 Ryan Taylor plays a clever first-time pass to Ameobi, but look at Assou-Ekotto on the edge of the shot. If he had got into a proper position, the flag may have gone up. Ameobi still has a lot to do from this position – the angle is against him, and Walker is working hard to stop him getting a shot away (despite having picked up an ankle knock). …and picks out just about the only part of the goal that he could have scored in. IMO, the first goal could've been prevented. It's Friedel's error, as he was trying to catch the ball, he throws himself INTO the goal with the ball in hand. He should've just swing his right arm or fist the ball with his right hand. The second goal (as well as the endless attacks by the Magpies), was due to our style of defensive clearance, most of the times the ball lands back at the foot of the opponents. What's the purpose of color (on jerseys) then? or, are our backlines color blind? Focus should be why 2-2? Shouldn't it be 2-4? The two missed chances are, the first one, Walker, he tried to outrun the defence on his own whilst Ade was there unmarked and shouting for the ball..or was he going for "a go" again like he did against the Arse..? Clearly he has tasted blood...and he wants more!! The second one, Defoe..should have squared the ball short to Livermore (who was just a few feet away and in a much better position to score) instead of trying to take the shot himself with all angles shut. Obviously they both go for glory... I am so pissed! Lets face it Blackpool played like Newcastle and beat us 3-1 the year before Hull bet us two seasons ago and last season West Ham beat us and drew 0-0 all these got relegated. Enerdy levels are being tampered with Just look at the miles Tiote ran and both him and Oberton in the 80 odd mins chased Bale like there lives depended on getting the ball.. I no what's going on and so do the FA Ufa and Fifa no what the problem is The ammont off abuse of eneegy is too big too stop and the five Mexicans proe my point they belong too clubs so who do you blame there clubs or the Mexican International Managment so Fifa come up with contaminated meat for Glenbutarol present in there bodys. This is laughable and one of many excuses for playes failing test for having energy drugs in the samples these are the latest. The meat wifes slimmers to hellp weight loss Toure Paddy Kenny bad cold Dynamow Moscow who where leading Utd 3-0 at old trafford it finished 3-3 two players failed drug tests Ephedrine reason given bad chest colds the Scottish player said he bought is of the internet and it said it was okay too take all these got off or had lenient sentences Footbal is the worse offender for drug offenders and the problem is no deterrent fuelled by loads of money in the prem and fear of relegation, Was i impressed by Newcastle's work rate my truthful answer is no not with what i no and what i observed and what Uk sport told me when i reported a team for using Ephedrine the year they finished second. I feel it is too harsh to blame Friedel for any of the goals conceded. Bassong was at fault for the first goal as he did not cover the middle. That is the problem we had against Citeh as well. Seems like only King knows how to cover and make the last ditch tackles. Even Dawson and Kaboul are not able to do that. They all love to go for the further striker. The second goal was just a wonder strike. If Gomes was playing, we would probably have conceded the well struck freekick as well. As someone else has pointed out, we should have scored more. Bale was poor tonight, while Livermore had his best game. Vdv needs to be reined in and be more disciplined, while Defoe still needs to convince me that he deserves to start (you need to pass to teammates who are better placed then you). HR needs to open his eyes and sub players who are not playing well (Bale) and change formation if needed. I would sub Defoe in for Livermore/Walker/Bale. Why was Ade subbed for Pav? Hope there is an improvement in the next match. Toon fan here, was at the game and I always look forward to going to the spurs home game cos they're always entertaining, we were lucky to get a draw best had a bad day but demba ba worked well and ameobi came on a scored so I'll take it all day long. Spurs looked very off today and losing King was a massive blow. Also what the f&ck was the formation with modric on the wings...if he didnt have lennon then he should have stuck that livermore on the wing to do a job and let modric control the middle when he came inside and picked the ball up that is when spurs looked most dangerous. Good luck for rest of season except when we play you at whl. Defoe is, indeed, selfish. He does not give the bll to someone in better position. Modric plyed in the wrong position. Friedel did not position himself well for tht second gol. We once hd sriking problem. Now. we hve defence problem. Our defence crcked once King ws out. We need new good defender. Ble ws completely eclipsed. He should hve been substituted. Why on erth ws Byor removed nd replced by Pv only 2 minutes before the end. the 2nd goal was an excellent strike. 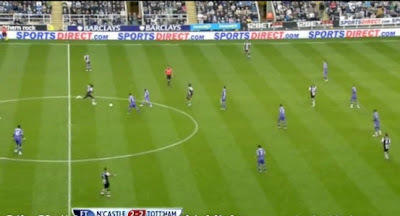 i felt we had been standing off ameobi too much, but looking at your screen shots, we were nowhere near. don't think the flag would've gone up if BAE had been further up the field. i think it's Bassong in the middle also playing him onside. he ran the line well (true though, BAE is not in the right position, but don't think it mattered for the goal. 1st goal, midfield switched off, simples. Sometimes, it's just a bloody good goal and the second one was. However, we should have been straining every sinew to gain and then retain position. One of the constants about Spurs is that we tend to drop further and further back towards the end of the game. That's the time to up the ante on the opposition: they will be desperate for possession and so will create spaces for us. That should have been three points, but to be honest I hate it when we play at St James' Park and had this down for a draw beforehand. We have some very important games coming up and could put daylight between us and the Goons. They have Vermaelen coming back and Wilshere will be back in the second half of the season when I think they will be very strong, assuming Van Persie remains fit. At present, Van Persie is Arsenal and he was the only difference between them and us for fourth spot last year. Liverpool flatter to deceive at present. As someone hinted at above, we have played better against worse teams and come away with much less. So we normally do badly against Newcastle but this year we got a point, let's call it an improvement and move on to the next seven games against teams who should all finish below us. Having said that I never thought of Newcastle as a bogey team and didn't realise our record up there was so poor until the hype of this match. Poor performance all round, but a good result. very patchy good moments. Kaboul was impressive in the air but everyone was ball watching, especially Livermore for the first. 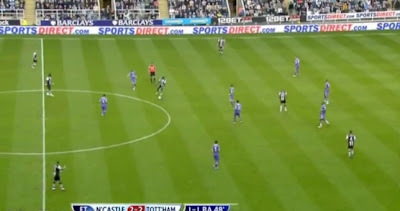 Why didn't Ekotto cover when he saw Ba coming in unmarked? Gomes would have got stick for both those goals. Modric started to play well at 1-1 carrying the ball through the midfield. A lot of lose clearances, giving them possession. I do not think we can blame Modric, but I feel that if we are to fully utilise him, we need to play Modric at centre - at all cost.